The 2017 sales season will be the last for Inglis at its iconic Newmarket complex, with confirmation the company’s new Warwick Farm base will be ready for use by early next year. Construction of the new $140m precinct, adjacent to the Warwick Farm racecourse, is set to be completed in December. As a result, this year’s Australian Broodmare and Weanling Sale (April 10-12), which has been moved back to its former timeslot to follow on from the Australian Easter Yearling Sale, will be the final sale held at Newmarket. The first sale at the new complex will be the Classic Yearling Sale, in early February 2018. The feature of the Warwick Farm precinct, to be known as Riverside Stables, will be a new luxury Hotel, named The William Inglis. Each of the 144 hotel rooms – including a number of large suites and family rooms – will have their own name and theme, based on one of the many champion racehorses sold through an Inglis sale ring. 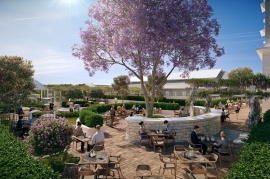 There will be a range of hospitality facilities to service our new and existing customers at the hotel including a paddock to plate-style restaurant and gardens named The Newmarket, a ringside bar, a lobby café and a micro-brewery and entertainment precinct. There will be a spectacular rooftop bar and pool deck overlooking the racecourse and stable precinct, with sweeping views of the Georges River and Chipping Norton Lake. Also on the rooftop will be a wellness centre and day spa to pamper our clients during sales and hotel customers throughout the year, plus a fully equipped gym overlooking the grounds. There will also be an extensive range of conferencing facilities and private dining and meeting rooms. In honour of the existing historic Newmarket Stable in Randwick, a large barn is being constructed for use during major horse sales which will also double as a fantastic venue for weddings and other events and special occasions, overlooking the racecourse and surrounded by beautiful gardens. It will be simply known as The Big Barn. Inglis is currently finalising plans for the new hotel to be run by Accor Hotels, the largest hotel operator in the Asia Pacific. It will most likely be an MGallery by Sofitel-branded venue. Adjoining the hotel will be a fully integrated air conditioned sales arena, which will accommodate 1000 guests including a ringside dining service for at least 600 customers. Overlooking the sales arena will be eight corporate boxes for VIPs to dine and bid in private with access to a mezzanine bar, to be known as the 1867 Lounge. There will also be additional tiered and casual seating for spectators downstairs. The pre-parade ring adjoining the sales arena will honour the company’s heritage, with two large metallic fig tree sculptures to provide shelter and character to the facility. Either side of the hotel will be two Moreton Bay fig trees, which have been grown from saplings of the famous Newmarket Fig Tree over many years in readiness for the relocation. The facility will feature more than 800 stables re-using the magnificent hardwood from the existing Newmarket stables. There will be extensive parade space for horses on both rubberised bitumen and synthetic turf, a highlight being more than double the amount of parade space per horse than is currently available at Randwick. Permanent hospitality suites for vendors will help to entertain buyers leading up to and during the sales in style and air conditioned comfort. The quality of landscaping at Riverside Stables will be of the highest order, with more than 200 advanced trees to be planted and replenished with harvested rainwater. A feature of the complex will be a 300m avenue of Cyprian Plane Trees (Autumn Glory) either side of the central spine, providing an incredible vista from the hotel and sales arena towards the river. The central spine will provide separate walkways for horses and pedestrians, to ensure safety for all. The avenue of trees will host the Inglis walk of fame, which will celebrate and honour champions on and off the track. The extensive array of horse parade areas will be sheltered by advanced Chinese Elms and bordered by clipped evergreen hedges, Camelia’s and Crepe Myrtles. The gardens adjoining the Newmarket Restaurant and The Big Barn will be elaborate, providing a haven for our customers on sale days and a wonderful venue for social and corporate events to support the hotel's operations. There will be an abundance of car parking at the new facility, which is 25 minutes from Sydney International Airport and in close proximity to several major motorways. In addition to the new William Inglis Hotel, there are a number of other hotels nearby including a Holiday Inn, Mercure, Ibis Styles, Rydges, Travel Lodge and Quest Apartments. Inglis will maintain its good relationship with existing partner hotels such as the Crowne Plaza in Coogee and the Intercontinental in Sydney and Double Bay. All of these hotels, whether in the Sydney CBD, Eastern Suburbs or the local Warwick Farm area will be well serviced by Inglis shuttle buses and limousines where appropriate, to assist vendors and buyers. “After years of planning, the time has come to relocate our Sydney business to its new home, a truly world class sales and events facility at Warwick Farm,'' Inglis Managing Director Mark Webster said. "The Riverside Stables complex is a massive investment by Inglis, and has been created to service the thoroughbred racing and breeding industry for the next 100 years. "Newmarket has been a wonderful home for our company and I have great respect for the role it has played in the lives of our customers over many generations. "The team here at Inglis look forward to celebrating those memories over the coming months with all of our loyal customers and friends, whilst we also unveil all the wonderful attributes of our new complex. “Our final year at Newmarket also coincides with our 150th year of service to the industry. There will be a number of events in the coming months to celebrate all that is old and new, including a farewell party at Newmarket for our customers on the eve of the Australian Broodmare and Weanling Sale, and another party for existing and former employees of the company later in the year. "I encourage everyone to join in the celebrations and enjoy the remaining three months of sales at Newmarket. Inglis will be arranging monthly “hard hat” tours of the new facility for industry participants commencing in March. Details will be released soon. Webster, Jonathan D’Arcy and other senior managers from Inglis will be in contact with customers over the coming months to discuss in more detail the transition to Riverside Stables, including stabling, hospitality and to explain in more detail how the new complex will operate. To learn more about Riverside Stables, nearby hotels, entertainment options, transport details or other FAQs and to follow the development, please visit www.riversidestables.com.au.